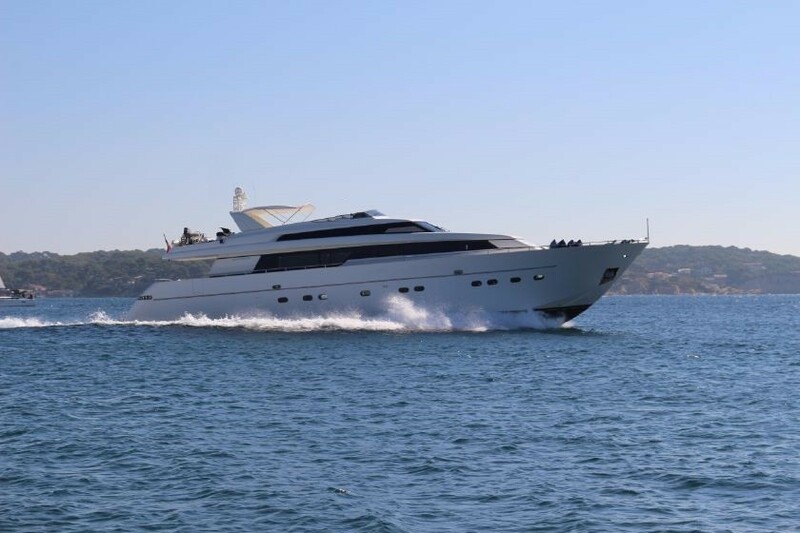 Built by Sanlorenzo in Italy and launched in 2004, luxury motor yacht ZEN measures 26.80m (87' 11") in length and was refitted in 2018. Her spacious and inviting interiors offer accommodation for up to nine charter guests in four beautifully appointed cabins. 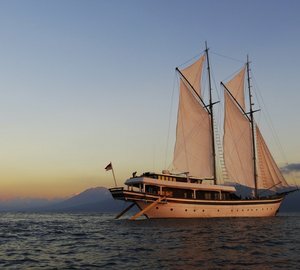 She has an attentive crew of four, looking after your throughout the entire vacation. Guests arriving by tender can disembark at the swim platform, which has room for chairs close to the water and a ladder provides easy access in and out of the water. Two staircases connect up to the main deck aft and the informal alfresco dining area consisting of a sofa integrated into the stern, a raised table and additional chairs. For sunbathing, guests can head to the bow for the sun pads or use the port stairs on the main deck aft to reach the flybridge. Here, the tender is stored to the stern and a Davit crane provides easy launch and retrieval, while under the hardtop a massive C-shaped sofa and table allows for the whole group to remain outdoors for meals with a view. Forward, sun-exposed double-sized sun pads are placed on either side of the flybridge for guests to rest after a hearty lunch. The interiors use a classic combination of rich wooden panelling with pale white furnishings for sophisticated and tranquil surroundings. The lower deck hosts the guest accommodation, with a VIP stateroom placed amidships in front of the engine room, followed by two twin cabins side by side and the Master suite forward. The main deck salon is comprised of a forward formal dining area and an aft salon that enjoys plenty of light from the large glass windows on both sides. The formal dining area seats up to eight guests in a classic setting and a grand mirror on the forward wall enhances the illumination. In the lounge, an aft-facing L-shaped sofa is placed beneath the port side windows and a coffee table creates the ideal place for conversation over drinks. A pair of MTU engines produces a cruising speed of 21 knots with a top speed of 27 knots. Guest accommodation is provided in four cabins, each with its own ensuite bathroom. There is a full-beam master suite with a large walk-in closet, a VIP cabin also with a large closet, one twin cabin with a Pullman bed and closet and one twin cabin, which is convertible into a double cabin, offering a closet.